*Membership Fees are based on your number of full-time employees. FREE listing in our Membership Directory and on Chamber Website Directory. City Map advertising is available every 5 years. Quarterly Business Seminars, Monthly Mixers & Chamber Networking Lunches, opportunities to meet elected officials, ribbon cutting & grand opening festivities. Relocation packets over 1,000 each year are distributed to persons & businesses interested in relocating in Monrovia. Chamber member businesses, phone numbers & address, are listed in each packet. Business Seminars, workshops, SBA, SBDC, Economic Partnership and joint San Gabriel Valley Chamber functions are open to our members. A yearly Installation Banquet & Citizen of the Year Business Person of the Year Awards. Mailing Labels, lists, and Newcomers Program may be purchased by members only. We are a voluntary non-profit corporation comprised of the businesses in this community. The Chamber of Commerce harnesses the tremendous potential of the private enterprise system and enables its membership to accomplish collectively what no one could do individually. Founded in 1897 and incorporated in 1939, the Chamber continues to grow to meet the challenges of today's business climate. 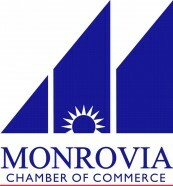 The policies and programs of the Chamber are determined by the membership. They, in turn, employ a paid chief executive officer whose basic responsibility is to organize and execute the Chambers program and carry out its policies. 'Monrovia Insider' newsletter for information, advertising, articles. IF THE CHAMBER DIDN'T WHO WOULD? Speak up for business with government leaders regarding proposed and existing laws and regulations that have an impact on business. Membership fees are billed yearly and are based on the number of employees at your business.